Happy Monday!! How was your weekend? I hope you had a great one! Jordan’s cousin got married this weekend, so we had rehearsal dinner Friday night, and then the wedding was on Saturday! Sunday we did nothing, which was great. We took another shot at the movies with the boys Sunday morning, but this time around we went to see Transformers, and I will say they did MUCH better watching Transformers than the Cars 3 movie. Although the film was like 3 hours long, and Colin ended up falling asleep at the very end. Anyways, many of you have been asking for some 4th of July outfit ideas. I’ll have two looks this week for you, this being the first look. My idea for 4th of July outfit this time around is just keeping it easy and simple. 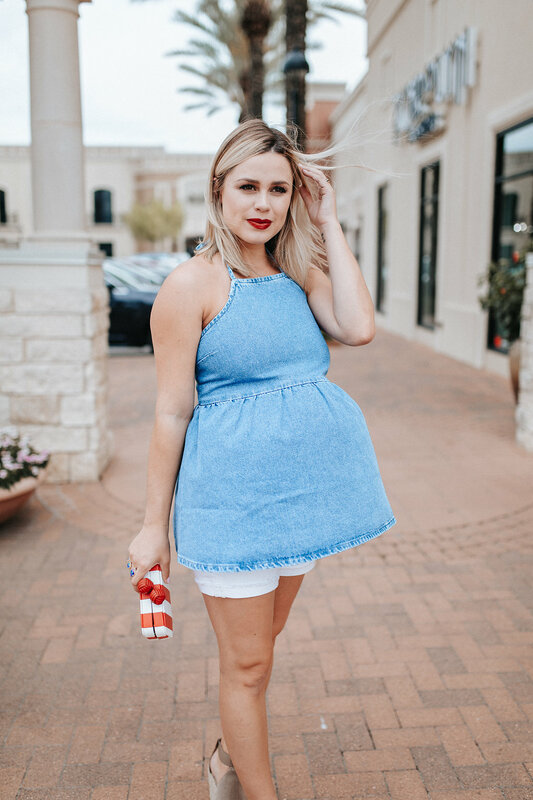 I’m 34 weeks pregnant, and the less clothing I can wear in this Texas heat, the better for me! Haha. 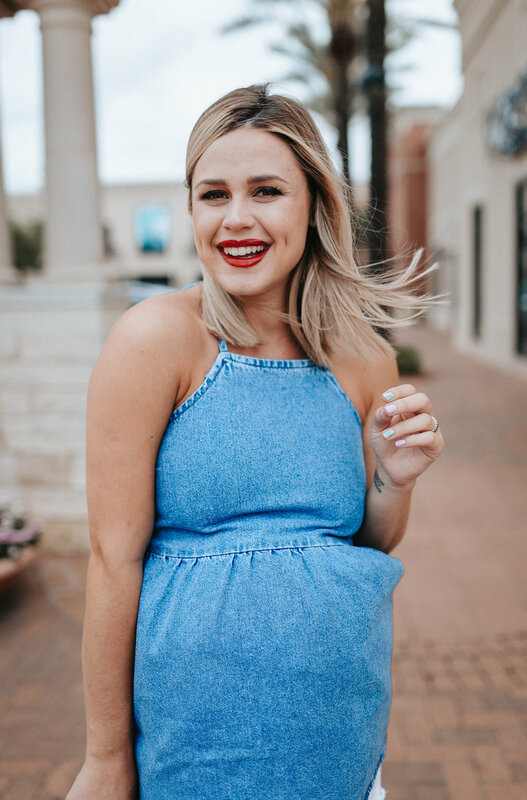 So for this denim on denim 4th of July outfit, I went with this fun halter denim top. Which by the way, if your ladies have grown significantly (like mine have) I would suggest going up a size. My top is borderline too small. It does not give or stretch, so I think going up a size would make it a bit more comfortable. To complete my 4th of July outfit, I went with my white denim shorts and added a touch of red with my clutch and lips. Told ya, easy peasy and not a lot of fuss! Hope you like this look, and thanks for stopping by! Have a great week. 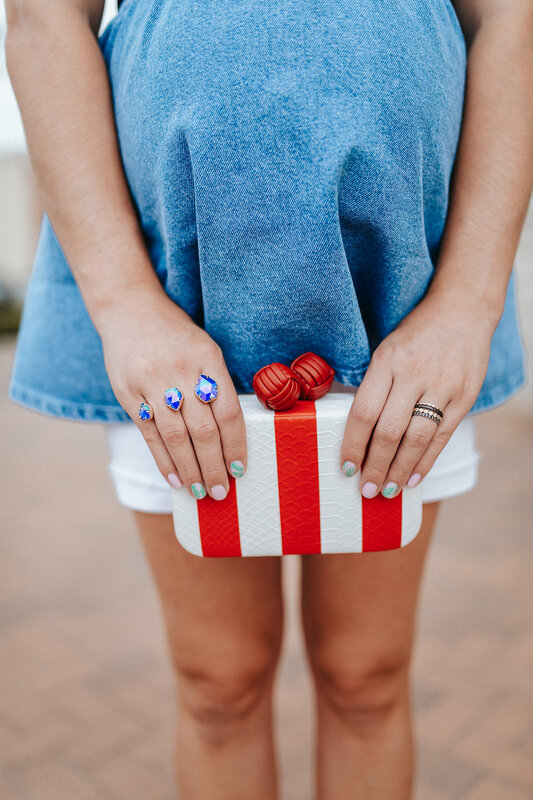 Very cute and appropriate for the 4th of July. You look lovely! 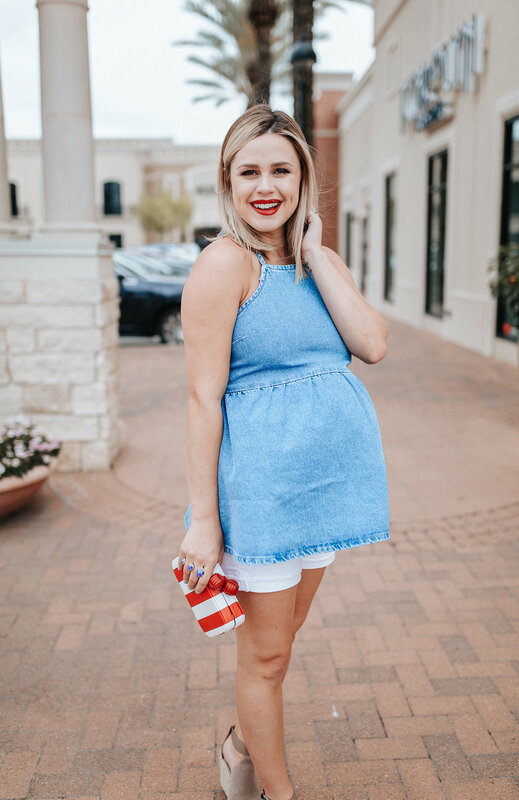 You’re such a cutie and this is a perfect, comfy and stylish maternity look for the 4th of July celebrations.